Saryo-Hosen is well known as a Japanese sweets (Wagashi) shop in Kyoto. Although it is located in the residential district and there is no subway station near the shop, so many people visit and enjoy its sweets at the traditional Kyoto-style townhouse called Kyo-Machiya. All tables are with a Japanese garden you can look at while eating. There is no background music to make cozy ambiance and spend your time homely. The sweets that are made by a very charming Japanese sweets expert, are really delicate like a jewel. Warabi mochi (Bracken-dumpling) is an absolutely MUST-EAT sweet! This is made by Bracken flour that is extremely rare! You will be into bouncy and smooth texture. Seasonal Japanese sweets of the day with Matcha are also available. 6 of these authentic sweets are not on the menu book and instead 6 kinds of them will be served instead shown for you to select carefully. All seats are on Tatami mats. Please enjoy at Japanese-style surroundings. This is the sweet you can eat only at this shops. It looks too brilliant to eat. Try having them with dense brown sugar syrup so that it comes out rich and elegant flavor more. Unique smooth texture that you may have never had. The expert start making it right after you ordered so that so fresh Warabi mochi are offered. Why not make yourself relaxed with the garden during waiting. 6 kinds of seasonal sweets are not only expressed 4 seasons, but also changes between the seasons delicately. Its natural sweetness itself make you happy with a bit bitter Matcha. 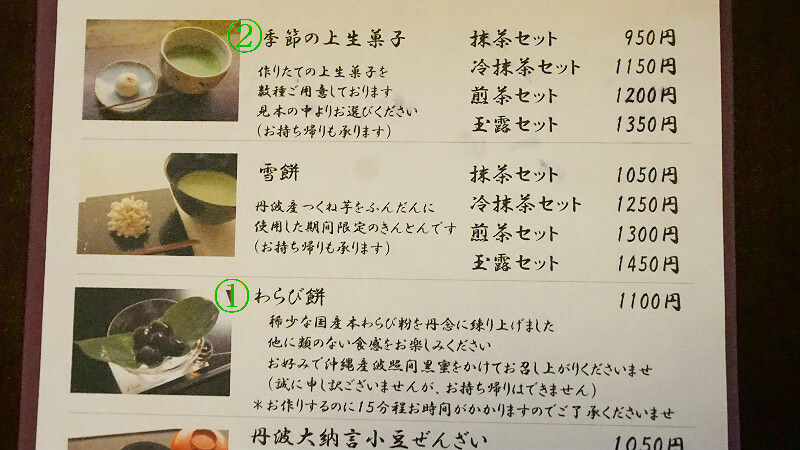 there are other green tea menus you can choose instead of Matcha. Prices are changed according to drinks. There are a lot of souvenirs displayed at the entrance of the shop. They offer from a pack of original Japanese sweets and some of them are provided by the piece. Let’s buy one of them to try! All selections are worth getting! Note: If you are interested in getting something as a souvenir to your country, Please check the best before date. 6 of these authentic sweets are not on the menu book and instead 6 kinds of them will be served instead shown for you to select carefully. Warabi mochi takes less than 10 minutes to be served. You can be satisfied with the garden because all tables are set in front of the garden. Warabi mochi are not offered for take out so that you can eat it only this shop I extremely recommend you to visit to eat such a rare sweet! 3-minute walk from city bus Shimogamo Higashihonmachi stop getting off. 20-minute walk from Keihan Line Demachiyanagi Stn.